What does this mean? Well, it means that manufacturers will be able to start building their Windows 8 PCs, notebooks and SoC (System on Chip) tablets from the first week of August, embedding the new OS in the products for release in October. Although a dedicated date wasn’t noted, Microsoft is sticking to early plans to launch Windows 8 at the end of October. It means that the likes of Samsung, Dell, Lenovo and other major OEMs will be making their new devices available to consumers at this time. Microsoft CEO Steve Ballmer referenced the Surface tablet lineup, but a launch date was not shared with attendees at the WPC event. Ballmer was quick to note that Surface was a small part of Microsoft’s plans and that a lot of focus what on its Windows 8 partners to design and release compelling notebooks and tablets of their own. In June, Microsoft showed-off its new Surface tablets, which it calls a ‘whole new family of computing devices’, demoing Windows RT and Windows 8 Pro models. The entry-level Surface is a tablet which is 9.3mm thick, features a full-size USB 2 port, 1366 x 768 display, beveled edges canted at 22 degrees and weighs 1.5 lbs. 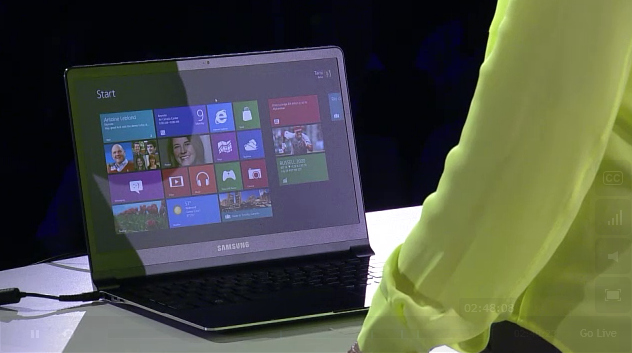 The casing is made of magnesium and Microsoft calls Surface, a ‘full PC’. This makes it 0.1mm thinner than an iPad and 0.06 lbs heavier. The pricing was not announced at the event and Microsoft said that it would be released ‘closer to availability’ and is expected to be “competitive with a comparable ARM tablet or Intel Ultrabook-class PC.” It said that its OEM partners would have “cost and feature parity” with the OS variants. The RT version will be available with the release of Windows 8 and the Pro version will come 90 days later. They will be available in physical Microsoft Stores and select online Microsoft Stores only.